The main street tagged up cornerblock has a new occupant. After a month of seeing nothing but the blue shower curtain like drapes, the doors finally opened. 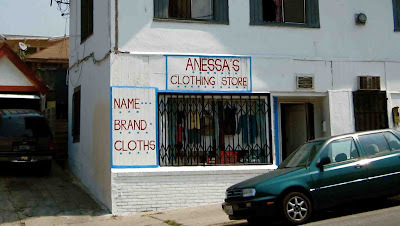 Anessa moved in and opened a name brand cloths store. If the E doesn't fit, it just doesn't fit. But I applaud them for their handpainted colorful sign! Love this corner. Constantly tagged up. Roaming gimmie money lady. Kids having a blast. Martinez tacos during Dodger games. I still hope for a little cafe in that spot someday. But wish Anessa success. 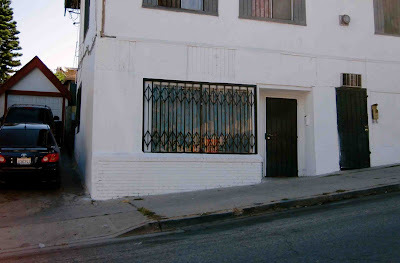 Cheap rent and Montecito Heights dreams! I could use some new cloths. roaming gimmie money lady? are you referring to the one on the opposite side of the street who stands holding her purse next to the stop. I never thought money to be her interest, rather she seems to be more waiting for a ride that will never show up. Stuck in a memory we call alzheimers. Yes, that lady. And unfortunately she only wants money.